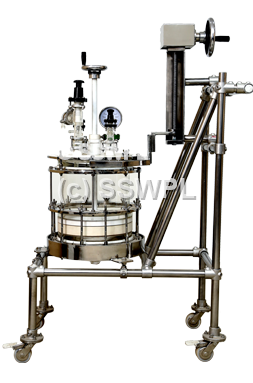 The borosilicate glass/PTFE Nutsche filter is very useful for filtrations using acidic media. Neutsche Filters are widely used for the separation of mother liquor and the solid product, in chemical, Pharmaceutical and other process industries. It can hold bigger quantity of material and hence frequency of cleaning of the filter media is very less. The operating pressure is 0.5 bar and vacuum is used to speed up filtration. The perforated filter plate is constructed from glass reinforced PTFE, the TOP AND BOTTOM cover is Glass Filled PTFE & PP cloth is used for the filter membrane itself. The filter cake can be discharged by simply pivoting the glass cylinder with the perforated filter plate. The design of the filter plate has reduced the dead volume under the filter meaning these filters are especially useful for solid phase synthesis. Nutsche filters mounted on wheels can be transported to wherever they are required. Sizes available: From 5 liters to 100 liters. The brand name and logo of “Super” as mentioned in our web was originally founded by Super Scientific Works Pvt. Ltd. during its incorporation in 1982. We excel in supplying all the products as mentioned in our website. We work as a sole entity and do not have any sister concern company. Hence, we recommend you to consider above facts while choosing the right and a credible business partner for your needs.